BikeALERT has been designed to help protect the most vulnerable people sharing our roadways, bikers! We pioneered this product over a decade ago, and we’re proud to keep them available for your protection. BikeALERT helps capture and hold the attention of inattentive drivers that spend more time focused on their smart phone, than the back of your bike. It will strobe a high powered LED Array at any time you decelerate. Because it’s motion sensing, it will even warn motorists when you gear down and let out the clutch for engine braking. Simply rolling off the throttle, pushes back those unnerving tail gate drivers behind you! 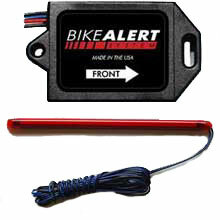 The primary component of our BikeALERT product, is our custom made module manufactured here, in the USA. It connects to a switched 12 Volt power source, and can be used with any 12 volt Led of your choice. 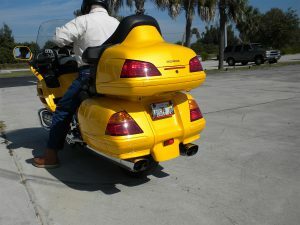 Typically, we suggest mounting an array on the top or bottom edge of your tag frame however, the arrays may also be affixed to trunks, saddle bags or fenders. If you’d like to protect yourself and your bike with one of our systems, please contact us.